With regard to the amount of costs and disbursements on review, defendant filed a statement of those costs and disbursements seeking the total sum of $561,816.84, plus $638 per day from July 1, 2010, until the letter of credit procured by defendant is released. Plaintiff filed objections to the cost bill, including an objection that defendant had waived any claim for costs incurred before the Court of Appeals. Plaintiff asserted that defendant did not timely submit a claim for those costs under ORS 20.320 (cost statement must be filed 21 days from the date of the appellate court’s decision) and ORAP 13.05(5)(a) (same; also providing that the filing of a petition for review or reconsideration does not suspend the time for filing a cost statement). 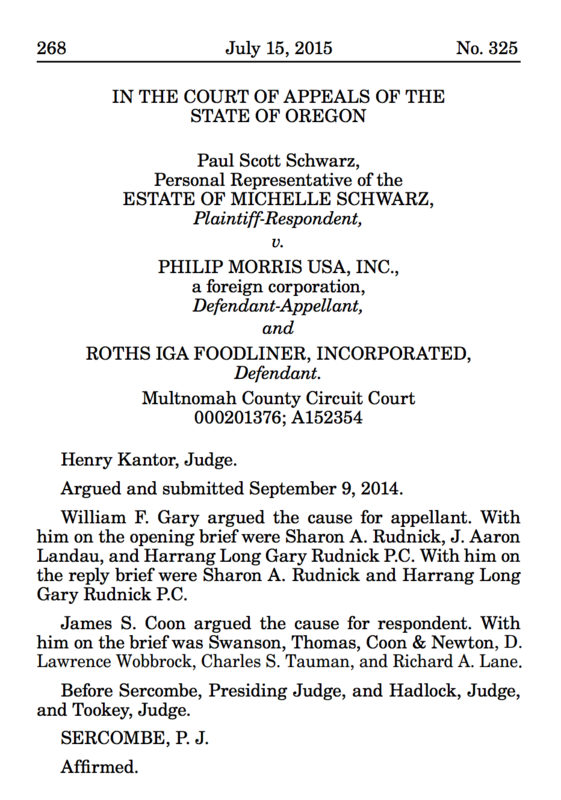 Plaintiff’s objection is well taken, and we disallow defendant’s request for costs that it did not seek within 21 days of the decision of the Court of Appeals. Those disallowed costs include the transcript costs ($10,037.80) and costs related to maintaining the letter of credit prior to the issuance of the Court of Appeals decision. We allow the prevailing party fee ($100), the filing fee ($140), and the cost of filing briefs in the Supreme Court ($255.10). We also allow the cost of maintaining the letter of credit after the Court of Appeals issued its decision ($367,205.82 through June 30, 2010). The total amount of allowed costs is $367,700.92, plus $638 per day from July 1, 2010, until release of the letter of credit or issuance of the appellate judgment, whichever occurs first. Tagged HLGR. Bookmark the permalink. 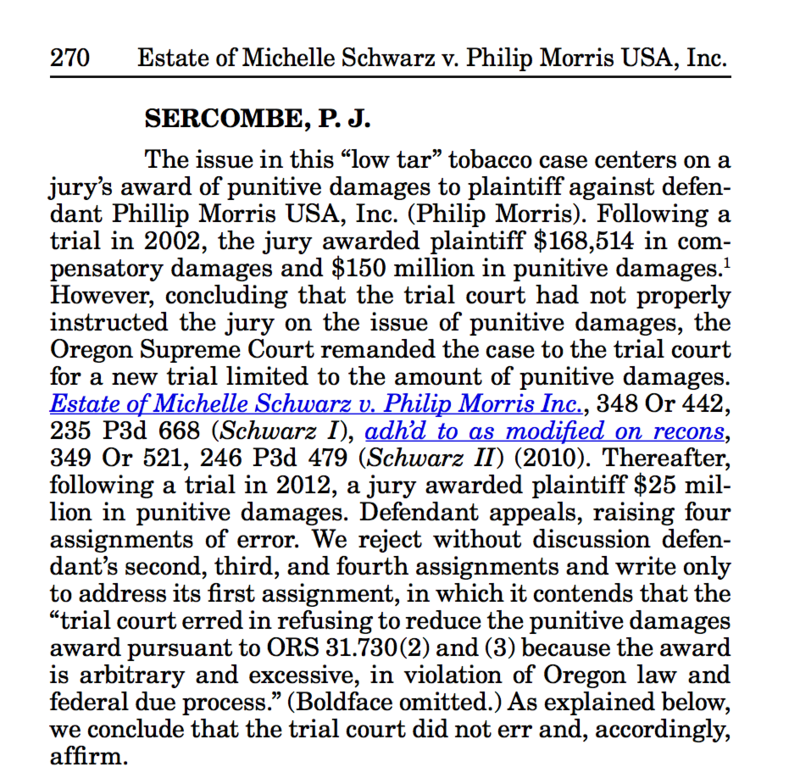 Unless I’m missing something, they saved Philip Morris $125M on appeal. First they lost PM $150M, then they saved PM $125M. I’m thinking that’s a $25M loss. Plus the billable hours, of course. I’m no legal scholar but I know that very few large-scale corporate cases are argued with a full win/loss in mind but a mitigation of damages. But any loss looks worse than a similarly scaled win would seem a positive. I think in economics it’s referred to Prospect Theory? Gary and Rudnick were not brought into the case until after a jury had awarded punitive damages of $150 million. On appeal, they were successful in winning a retrial as to the amount of punitive damages. A second jury reduced the award to $25 million. How does that amount to losing $25 million for their client? Is there no limit to your willingness to lie and distort? Thanks for the clarification Mr. Gary. I’ve corrected the post to say “save $125M for Philip Morris” instead of “lose $25M for Philip Morris”. I’m still wondering how much HLGR ultimately “won” UO for the Cleavenger case. I’m not sure if “wrong again” is really Bill Gary, but whoever it is is not giving the entire history. He stops with the second jury case, which HLGR “won”, if you want to call $25M in damages a win. But after that award Gary and Rudnick appealed again (the case Harbaugh links to) and they lost their attempt to have the $25M award set aside. So in the end Philip Morris had to pay $25M, plus interest, plus a lot of attorney’s fees. Bill, you know nothing about how the law works or how lawyers work. You are so wrong on this one I wouldn’t be surprised if you are sued. Please do explain, kind sir. I was looking for a high-priced corporate lawyer for my evil corporation. Google brought me to this page. I reasonably concluded based on the information on this website that Bill Gary lost a different amount of money than he had in lost in reality and decided to bring my evil’s corporation’s business to another high-priced law firm which is either more SEO friendly or has better relations with bloggers. Surely you don’t mean to suggest that you believe Bill Gary and Sharon Rudnick are so stupid that they would sue a blogger for defamation because he had posted rulings from the Oregon Supreme Court and Court of Appeals? it isn’t that he posts rulings, it is his misleading headlines, his attempts to discredit law firms and sometimes his flat out lies which are not protected speech. I don’t know if they will sue him or not but it seems clear to me he is out to discredit anyone he decides he doesn’t like. Also, why are you going back five years to find something you think will embarrass these guys? What does this have to do with UO? You are being truly stupid this time. Please stop – I believe that the reason that this is relevant is bc HLGR is the go-to law firm for every pickle that the UO finds itself in. They have made a ton of money from the UO’s pockets – money that could go to education if they would just get rid of the knuckleheads that continue to cause the problems. Also, please don’t name call (stupid) as it is beneath you. Your comments and thoughts are welcome if done in a respectful manner. Angel, but knuckleheads is not name calling? The UO hires many attorneys. HLGR does seem to get the hard ones. My point was that UO Matters frequently gets the details of law suits and legal wrangling all wrong. Most of the time he is simply dead wrong with his suppositions and poor reading of the briefs. He really is likely to get sued one of these days. And by the way, I did say “please”. The “hard ones” are the cases UO shouldn’t be fighting in the first place, at least from an ethical standopint. HLGR seems to be the janitors for when UO really shits itself but figures they can weasel out of it. It’s hard to have respect for that. Your defamatory comment is an insult to the good work that UO’s janitors do every day. I demand an immediate retraction! Everyone gets to have a lawyer. That’s the law. What you think is unethical may not be what everyone thinks is unethical. From the outside it is hard to say what is right legally, especially when you don’t know both sides or WHAT THE LAW IS. That’s why they have lawyers, to argue THE LAW. Everyone does get to have a lawyer, but very few defendants are able to dip into publicly-funded “insurance” to pay for them or get the kind of broad discretion, legal advantages, and judicial abstention that (especially public) universities get. Under THE LAW, universities can get away with all kinds of crap that other defendants would get hammered for. Universities have these extraordinary privileges because they’re supposed to be using them responsibly and ethically rather than purely to advance their own interests. Bill Gary — is he the guy who helped come up with the disastrous PERS “reforms” a couple years back, then defended them in court — and saw overturned by a unanimous vote of the Oregon supreme court? Wow! Do you have that one wrong! To answer your question simply. No. Please keep it up. I was once the victim of a (Washington, DC) law firm that bulldozed over me and my family, using all sort of dishonesty, for no reason other than it helped their bottom line. I would love to lampoon this particular law firm, but I can’t because I had already maxed out my credit cards paying some other lazy tool several hundred dollars on hour to ‘defend’ me. Eventually I signed a very restrictive non-disparagement agreement and now I’m left to stew. So while I can’t poke fun of the law firm that victimized me, I really enjoy it when people who haven’t had their rights stripped from them go ahead and use these rights to call out lawyers for being immoral asshats. God Bless America, please keep it up! I wasn’t going to bother with this, but I am a fan of Bill Gary. About 15 years ago, and for the only time, I was against him in court. He made us look like idiots. He was better prepared, knew more law than we did and was a truly gifted speaker and advocate. I learned a lot that day and am a better lawyer for it. Tell me what he does pro bono to defend individuals against powerful institutional clients, and maybe I’ll be a fan too. In 2014 Bill Gary and Dave Frohnmayer fought legislation that would have increased funding for legal aid for the poor: http://uomatters.com/2015/03/would-you-pay-to-take-a-uo-law-course-from-this-man.html They helped kill it, but the legislation passed the next year. Loving this thread. Please DON’T stop! Whatever I think of HGLR doesn’t matter. What matters to me is that out of all the law firms in Oregon, the UO picked the defenders of big tobacco co’s to represent the university.